Android Nougat has managed to climb to 4.9% of usage shares, from its 2.8% a month ago in the latest Android Distribution Numbers. The sudden rise in the number, can be attributed mostly to Samsung, which released OS updates for its 2016 flagship devices, and a few other OEMs such as Motorola and OnePlus, who did the same for their devices. 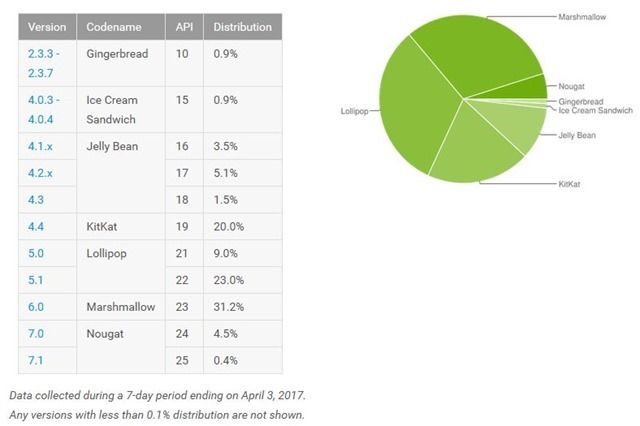 You can see the Android Distribution Numbers April 2017 chart above. Of that number, Android 7.1 Nougat just holds a 0.4% share, mostly due to it being exclusive to Pixel and the last gen Nexus devices. With an Android O Preview available for those devices, the next Android Distribution Numbers update. could see a slightly slower rise in 7.1's numbers. Its predecessor, Android 6.0 Marshmallow did not fare well, and instead of seeing its numbers rise, it dropped by 0.1% from 31.3% to 31.2%. Android 5.0/5.1 Lollipop fell from 32.5% to 32 but still remains the one to beat. Android 4.4 KitKat lost the most shares in a month, as it slipped from 20.8%, to 20.0%. Jelly Bean has a 10.1% share, compared to the 10.6%, which it had in March. Ice Cream Sandwich and Gingerbread fell from their longstanding 1% share, by a measly 0.1%, and now run on 0.9% of devices. We are still keeping our fingers crossed, for the day when Google makes OEMs realize that OS updates are an important part of customer service. Most OEMs who cater to the mid-range audience do not provide a single OS update, because they deem it as a non-profitable move, for the user though, it is a straight slap in the face.